A typical stretch of Newhall Ranch Road. The bridge carries a paseo over the roadway. The master planned portion of Valencia was first planned in the 1960s by the Newhall Land and Farming Company. Development began in 1967, continues to the present day, and is nearing completion. Valencia is notable for its landscaped boulevards connecting a mix of apartment buildings, single-family detached homes, shopping centers, office parks and industrial warehouses. Major schools in Santa Clarita include California Institute of the Arts, College of the Canyons, Hart High School, West Ranch High School, Saugus High School, Canyon High School, Golden Valley High School and Valencia High School. Valencia's residential areas are separated into villages, each with its own lifestyle (see List of Valencia, California residential villages). Almost all of Valencia's villages are close to schools, shopping, etc. In many of the villages, homeowner associations oversee the quality and upkeep of housing developments ranging in size from a few dozen homes to over a thousand. Many villages also have a neighborhood watch program in force. Valencia also has a system of paved pathways over or under the streets and boulevards. The pathways are called paseos. They connect the entire community, making it possible to travel throughout nearly all of Valencia on foot or by bicycle without crossing a street at grade level. 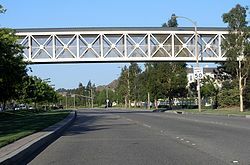 The paseo network is connected to the Santa Clara River Trail which runs east along the Santa Clara River to Canyon Country. Valencia is home to the Six Flags Magic Mountain theme park. Wikivoyage has a travel guide for Valencia (California). 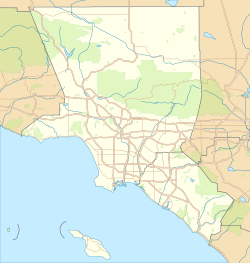 Wikimedia Commons has media related to Valencia, California. ^ Boston, John; Santa Clarita Valley Historical Society (2009). Santa Clarita Valley. Charleston, SC: Arcadia Publishing. p. 124. ISBN 9780738569383. Retrieved August 20, 2016. ^ Bolton, Herbert E. (1927). Fray Juan Crespi: Missionary Explorer on the Pacific Coast, 1769-1774. HathiTrust Digital Library. pp. 152–155. Retrieved April 8, 2014. ^ "Taylor Lautner Wants to Go Back to School". Extratv.warnerbros.com. June 29, 2010. ^ "Naya Rivera Bio". UsMagazine.com. ^ "Michael Trevino Biography". Mostbeautifulman.com. Archived from the original on February 2, 2015. ^ Berry, Zuri (April 29, 2011). "Patriots select RB Shane Vereen with the 56th pick". NY Times Co. This page was last edited on 11 April 2019, at 07:08 (UTC).